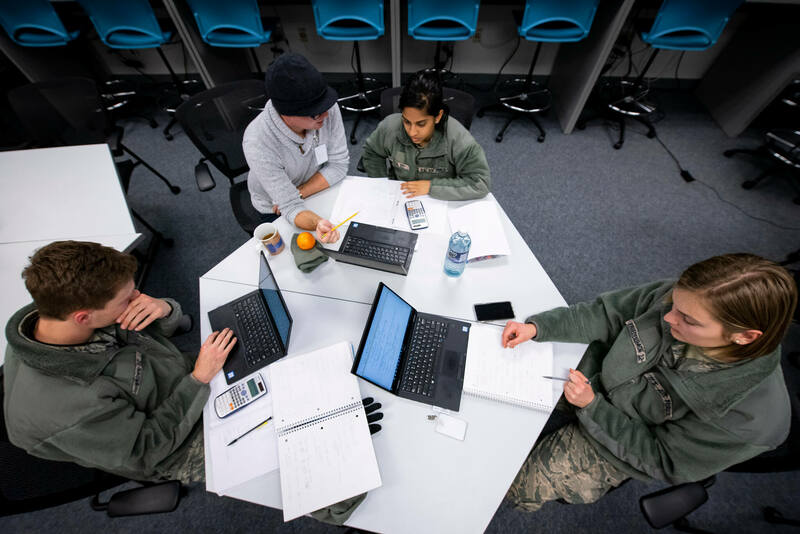 U.S. AIR FORCE ACADEMY, Colo. — Cadets at the Air Force Academy said the school’s Academic Success Center in Fairchild Hall helps them succeed in the classroom. The Academic Success Center offers cadets a reading enhancement course, the strategies for academic success program, a graduate studies office, and a quantitative reasoning center that features evening tutoring for cadets, 5:30-9:30 p.m., Monday-Friday. The nine-week reading enhancement course is offered four times a year and teaches cadets to read and comprehend efficiently. The strategies for academic success program, designed to improve cadets’ study skills, is open to all cadets regardless of academic standing. Cadets can get help on a walk-in basis. The graduate studies office offers four programs for graduates to earn advanced degrees after graduating. — The National Competitive Scholarship Program identifies, mentors and assists cadets competing for national and international scholarships and fellowships, including Rhodes, Marshall, Truman, Fulbright and Hertz scholarships. — The Endowed Scholarship Program is only for Academy cadets and funded by the Gen. John K. Gerhart Fellowship, the Alberta Bart Holaday Scholarship, the Gen. Richard L. Lawson Scholarship, the Earl and Marion Nutter Trust Scholarship and the Franklin C. Wolfe Scholarship. — The graduate studies office identifies potential faculty members by nominating graduating cadets for admission. The program allows cadets graduating in the top 25 percent of their class to pursue a 12-month master’s degree program. — The medical school program allows select cadets to attend medical school and later fill vacancies in the Medical Science Corps. At the QRC, faculty members provide cadets with extra instruction in difficult subjects, including calculus, physics, chemistry and engineering. McCaig said faculty members use a “growth mindset” at the ASC to help cadets. “Once cadets gain confidence and realize success, we encourage them to keep that momentum and grit as they improve and return to the ASC for help and advice,” she said. Cadet 3rd Class Itzel Chan-Topete, a civil engineering major, said the QRC staff helped her better understand his coursework. McCaig said the ASC’s vision supports and encourages academic excellence. “We’re here to assist all cadets become exceptional leaders as they read, think, communicate and lead men and women in the Air Force,” she said. Visit www.usafa.edu/academics/registrar/academic-success-center for more information.